As cleanliness of the interfaces in fiber optic networks can directly affect the transmission quality, fiber optic cleaning is a must-have process during fiber optic network installation, testing and maintenance. You should always keep it in mind. You need to clean the fiber optic interface on the test equipment and fiber optic connectors before you actually doing the test. 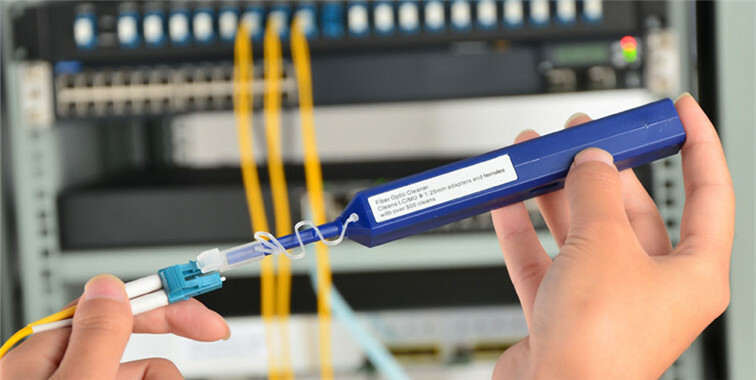 You need to clean the fiber optic connector or interfaces regularly in your daily maintenance. Various fiber optic cleaning methods are created. No matter you use dry cleaning or wet cleaning, basic tools are needed. However, we might be confused during the selecting of the fiber optic cleaning tools, cause there are so many different kinds of fiber optic connectors, interfaces and working environments. This post is to introduce the most commonly used fiber optic cleaners for different kinds fiber optic connectors. One-push fiber optic cleaner is one of the most popular fiber optic cleaner which eliminate the use of alcohol or solvents. Thus, it can save time efficiently with excellent performance. I would like to call it “Click and Cleaned”. Here I will introduce how to used one push fiber optic cleaner firstly. The following picture is the top of an one-push connector, the cleaning tip of the cleaner is covered with a guide cap for fiber optic connectors. A cover is on the top of the guide cap, which can provide protection to the cleaning tip combining with the guide cap. 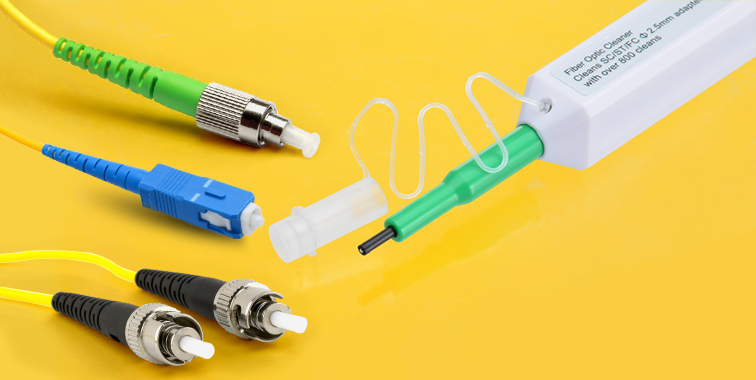 If you need to clean a fiber optic connector, the guide cap plays the function of a fiber optic adapter. Insert the cleaning tip into the connector with the guide cap as shown in the following picture, and press the cleaner until you hear a click. Then a cleaning is done by fiber optic cleaner. If you need to clean a fiber optic adapter, you should firstly remove the whole guide cap on the one-push cleaner. Then insert the cleaning tip into the adapter as shown in the following picture. Just by simple pressing, until you hear the click, a cleaning for a fiber optic adapter is done. It is very useful during test, cause the test equipment usually have an interface of adapter. 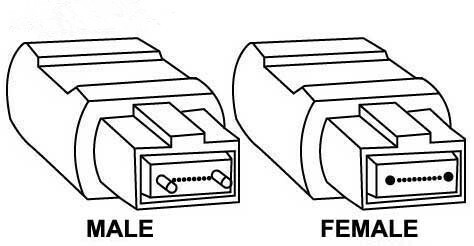 Different types of connectors might have ferrules of different sizes. Thus, there are also accordance fiber optic cleaners for various connectors. 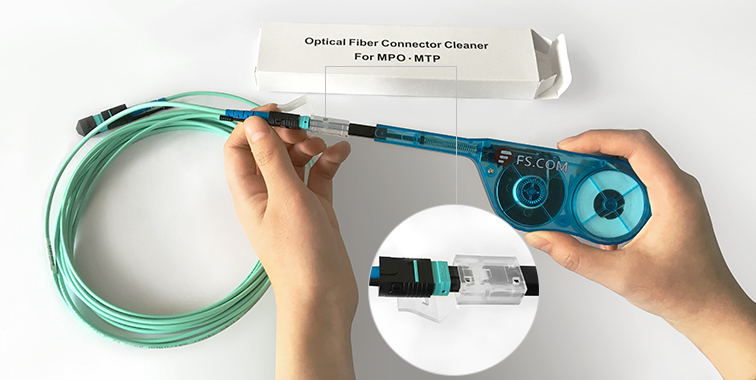 Introduces several popular one-push fiber optic cleaners for different connectors. Reel-type fiber optic cleaner contains a refillable lint free reel of cloth that is moved after each cleaning, always presenting a clean surface. Reel-type fiber optic cleaners come in different package forms, but most of them are cassette form. This type of fiber optic cleaner is able to clean a wide rage of fiber optic connectors, which also avoid the using of alcohol or solvents. The following shows the basic structure of a reel-type fiber optic cleaner and its replacement tape. The cleaning with this cleaner is also very simple. Firstly depress lever to expose cleaning slot and cloth. Second, slide the connector end face gently. Third, keep connector perpendicular to cleaning surface. Then a cleaning is done. The above mentioned fiber optic cleaners are just a small part of the cleaning product family and are generally for dry cleaning. Kindly visit FS.COM or contact sales@fs.com for more details about the wet cleaning for other fiber optic cleaning products. This entry was posted in Fiber Cable Connector, Fiber Patch Cable and tagged fiber optic cleaner, One-Push Cleaner, reel-type fiber optic cleaner on April 7, 2016 by Alice Gui. It is inevitable to plug fiber patch cables from the patch panels, switches or cassettes in today’s data center cabling. However, this simple movement becomes harder and harder nowadays. Why? 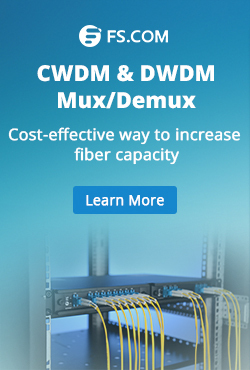 Both the data rate of every optical fiber and the fiber counts being used are increased to support high data rate up to 40/100G or more. Thus, the cabling density increased largely with the deployment of 40/100G Ethernet network. Finger access to every patch cable that is loaded on the patch panel, switches or cassettes becomes difficult. Especially for these patch cables in the middle of the space. For fiber patch cords attached with connectors like LC, things become more complex. Because this type of connectors are usually locked in the port with a latch on the connector body. If you want to plug out a patch cord with LC connectors, you should firstly unlock the connector from the port by clicking the latch with is with small size (shown in the following picture). Usually an external tool is used to unplug the specific connector in a high density cabling. It seems a problem doesn’t matter much in the whole cabling. However, during practical cabling, network engineer could be headache about this annoying problem. To find an easy and elegant way to solve this finger access problem, a new type of patch cords was invented, which is designed for high density cabling and is known as push-pull tab patch cords. What Is High Density Push-pull Tab Fiber Patch cable? Compare with the traditional patch cords. This new type patch cord is attached with a connector with a push-pull tab, which can perfectly solve the fiber access problem in high density cabling. Except the additional tab for pushing and pull, these connectors don’t change much from the traditional ones that attached to patch cords. But this little change makes a great difference. The following is offering you the details about this novel product. High density push-pull tab fiber patch cords are usually attached with LC or MPO connectors, as these two types of connector are currently the most popular in high density cabling like 40G, 100G, 120G or more. The following pictures shows the details of these two types of connectors with push-pull tab. The one in the left of the following picture is an LC connector attached on push-pull tab patch cable. It’s of standard LC size. When the tab is pulled the LC connector would be unlocked from the port easily, cause the tab is linked to the latch of the LC connector. 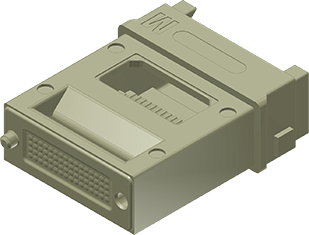 Once the LC connector is unlocked, the patch cords would be smoothly plugged out from the port and other patch cords around it by pulling the tab slightly. As for MPO connector with push-pull tab shown in the following picture on the right side. Finger access becomes easier. The tab can greatly simplify the use of MPO connectivity when manual access to the release slider and rear portion of the connector is restricted. In this way, easy insertion and extraction of MPO patch cords can be achieved. Is finger access the only advantage of push-pull tab patch cords. Definitely NO. The following illustrating will surely make you exciting about push-pull tab patch cable. Flexibility and adjustability: it has been proved that push-pull tab can increase the cabling density by 30% to 50%, which can satisfy the future high density cabling requirements for 120G or more. Reliability: To reach the specific connector you want, you might loosen or remove other connectors around it, which can highly increase the reliability of the network. Cost-save and time-save: it is clear that with push-pull tab patch cords, cabling becomes easy and elegant with higher ROI. If you are looking for a simple and easy high density patch cabling solution, push-pull tab patch cords provided by Fiberstore can satisfy your requirements. The following chart is the most common applications of push-pull tab patch cords for your references. This entry was posted in Fiber Cable Connector, Fiber Cabling, Fiber Patch Cable and tagged fiber patch cords, LC Connector, optical fiber on January 29, 2016 by Alice Gui. FTTH (fiber to the home) has become increasingly popular in optical communication industry. Fiber optic termination, as one of the topics which have never been out of fashion in this field, has naturally become a focus of FTTH network deployment, especially the indoor termination. In FTTH network, mechanical splice connectors are usually used in FTTH indoor termination with the advantages of flexibility, fast-installation and cost-effective. Currently manufactures can provide various types of mechanical splice connectors of high quality which have low insertion loss and high performance. However, no matter how excellent the mechanical splicing technology is, there are still fiber optic termination failures and bad fiber optic termination due to improper operation. To avoid it, this post is to offer the causes of mechanical splice termination failures. Before finding the cause of mechanical splice failure, the basic of mechanical splicing should be introduced. To finish a mechanical splice, the buffer coatings of fiber optic should be removed mechanically with sharp blades or calibrated stripping tools. In any type of mechanical stripping, the key is to avoid nicking the fiber. Then the fibers will be cleaved. Two fiber ends are then held closely in retaining and aligning a mechanical splice connector with some index matching gel between them. The gel are used to form a continuous optical path between fibers and reduce reflecting losses. 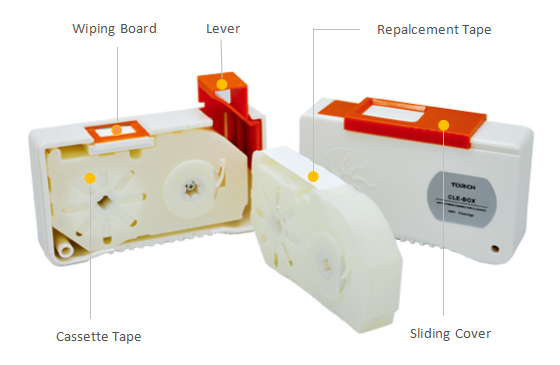 Mechanical splice connector is sensitive to many factors. There are also a large number of factors to cause failures. However, most of the factors are located at the end face of fiber optic. The following is to describe them in details. Please note that once the contamination is carried inside the mechanical splice connector, especially with the index matching gel, there would be little possibility to clean them out, which means the connector may be scrapped. Improper operation like overexertion when inserting the fiber optic into the mechanical splice connector might break the fiber optic and produce glass fragmentation which will cause air gap and optical failure. Or if a broken fiber if inserted, there will also be optical failure. If the glass fragments are embedded in the connector, they cannot be cleaned out and the connector would be scrapped. Thus, be gentle and carefully when splicing the fiber ends. Applying no tension or insufficient tension to the fiber while cleaving. The fiber was not held steady during termination and was pushed back into the fan-out tubing when terminating outdoor cable. These faults can be corrected one time. During fiber cleaving, cleave angle can be produced easily and is difficult to be inspected in field. These angles are typically ranging from 1 to 3 degree. Even with precision tool, there might still be cleave angle ranging from 0.5 to 1 degree. The angle is generally produced by bent tongue, fiber bending or insufficient fiber tension. However the cleave angles can be corrected by fine tuning with a VFL (visual fault locator). Rotating the fiber while using a VFL and terminate the connector at the position (as shown in the following picture). Fiber optic mechanical splicing gives quick and high quality result at a low price for fiber optic termination. 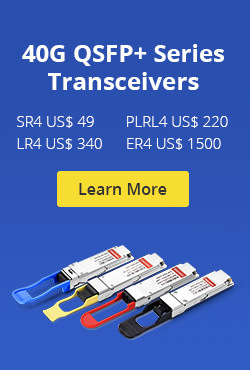 Choosing the right fiber optic mechanical splice connector and fiber optic cleaver of high quality is not enough. Acknowledge the possible causes to fiber optic termination failures and use the right tools with skills can reduce the risk of termination failure effectively. This entry was posted in Fiber Cable Connector, Fiber Cabling, Fiber Optic Splicing and tagged fiber optic cleaver, fiber optic splicing, fiber optic termination, FTTH, mechanical splice connector, Mechanical Splicing on December 4, 2015 by Alice Gui. MPO/MTP technology, which is of high density, flexibility and reliability with scalable, upgradeable properties, is one of the contributors that lead the migration to 40/100GbE. However, the network designers face another challenge which is how to assure the proper polarity of these array connections using multi-fiber MPO/MTP components from end-to-end. Maintain the correct polarity across a fiber network ensures that a transmit signal from any type of active equipment will be directed to receive port of a second piece of active equipment – and vice versa. To ensure the MPO cable work with correct polarity, the TIA 568 standard provided three methods, which will be introduced in this article. 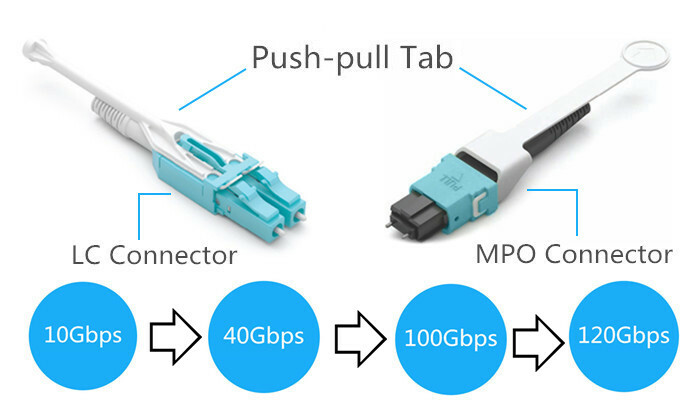 To understand the polarity in 40/100 GbE Transmission, the key of MPO technology—MPO cable connector should be first introduced. MPO connector usually has 12 fibers. 24 fibers, 36 fibers and 72 fibers are also available. Each MTP connector has a key on one of the flat side added by the body. When the key sits on the bottom, this is called key down. When the key sits on top, this is referred to as the key up position. In this orientation, each of the fiber holes in the connector is numbered in sequence from left to right and is referred as fiber position, or P1, P2, etc. A white dot is additionally marked on one side of the connector to denote where the position 1 is. (shown in the following picture) The orientation of this key also determines the MPO cable polarity. MPO Trunk Cable Type B: Type B cable (reversed cable) uses key up connector on both ends of the cable. This type of array mating results in an inversion, which means the fiber positions are reversed at each end. The fiber at P1 at one end is mated with fiber at P12 at the opposing end. The following picture shows the fiber sequences of a 12 fiber Type B cable. MPO Trunk Cable Type C: Type C cable (pairs flipped cable) looks like Type A cable with one key up connector and one key down connector on each side. However, in Type C each adjacent pair of fibers at one end are flipped at the other end. For example, the fiber at position 1 on one end is shifted to position 2 at the other end of the cable. The fiber at position 2 at one end is shifted to position 1 at the opposite end etc. The fiber sequence of Type C cable is demonstrated in the following picture. Different polarity methods use different types of MTP trunk cables. However, all the methods should use duplex patch cable to achieve the fiber circuit. The TIA standard also defines two types of duplex fiber patch cables terminated with LC or SC connectors to complete an end-to-end fiber duplex connection: A-to-A type patch cable—a cross version and A-to-B type patch cable—a straight-through version. The following part illustrates how the components in MPO system are used together to maintain the proper polarization connectivity, which are defined by TIA standards. Method A: the connectivity Method A is shown in the following picture. A type-A trunk cable connects a MPO module on each side of the link. In Method A, two types of patch cords are used to correct the polarity. The patch cable on the left is standard duplex A-to-B type, while on the right a duplex A-to-A type patch cable is employed. Method B: in Connectivity Method B, a Type B truck cable is used to connect the two modules on each side of the link. As mentioned, the fiber positions of Type B cable are reversed at each end. Therefore standard A-to-B type duplex patch cables are used on both sided. Method C: the pair-reversed trunk cable is used in Method C connectivity to connect the MPO modules one each side of the link. Patch cords at both ends are the standard duplex A-to-B type. Network designer using MPO/MTP components to satisfy the increasing requirement for higher transmission speed, during which one of the big problems—polarity, can be solved by selecting the right types of MPO cables, MPO connectors, MPO cassette and patch cables. The three different polarization methods can be applied according to the satisfy requirements in different situations. For more information about polarity in MPO systems and 40/100GbE transmission polarity solutions, please visit Fiberstore tutorial at “Polarity and MPO Technology in 40/100GbE Transmission“. This entry was posted in Fiber Cable Connector, Fiber Cabling, Fiber Optic Cable, Fiber Optic Transmission, Fiber Patch Cable and tagged 40/100GbE, MPO/MTP cables, MTP cassette, polarity on October 31, 2015 by Admin. This entry was posted in Fiber Cable Connector and tagged MPO connector, MTP connector, MTP/MPO fiber optic cable on September 18, 2015 by Admin.